There’s no problem finding Streblow boats on area lakes. There’s a virtual fleet of them and since Streblow owners aren’t shy about showing them off, they’re easy to spot for anyone who knows about boating. But finding where they build them is a different story. Streblow aficionados — and there are plenty of them — know exactly where their home base is, but the layman might have trouble finding it. An old mailbox marks the address, but it doesn’t say that it’s the home of a brand as well-known to boaters as Alfa Romeo is to race car enthusiasts. A one-lane ribbon of a road leads from the highway to the office and manufacturing facility. 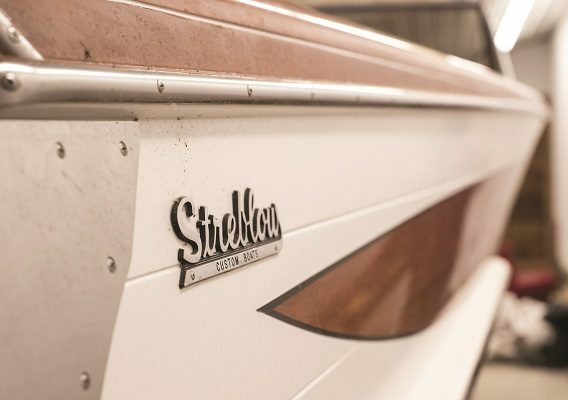 There’s not a single sign because there’s no pretense at the home of Streblow Custom Boats. When you’re the best, you don’t need to pat yourself on the back. No wonder the Streblow brand has gone more than a half century without a marketing plan. They’ve never needed one. The boat builder’s current owner is a man named Steve Horton. 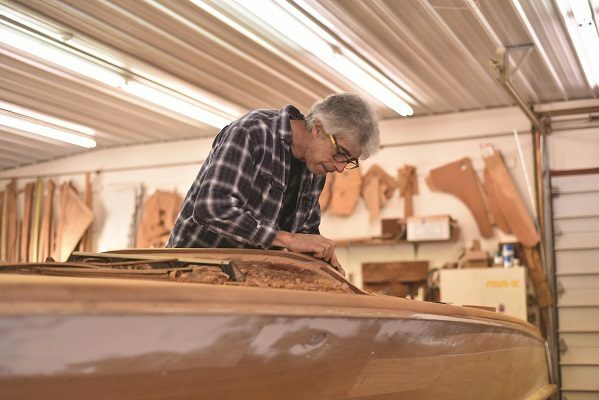 He follows two generations of Streblow; Larry, the patriarch, who started making boats in 1947 and died in 2003, and Larry’s son, Randy, who passed away eight years later. 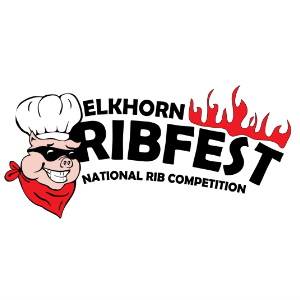 Horton, Streblow’s new leader, has worked for the company since 1983 and was once married to Randy’s daughter so he knows the brand and the tradition. Horton was brought up near the dam in Wilmot, Wisconsin, and grew up around southern Wisconsin waterways. “People who owned a bait shop were my neighbors,” he says. His passion for wood boats started when Horton was barely a teenager. He borrowed his brother’s fiberglass boat. “It had an engine big enough to take me to the Chain of Lakes, a place I’d never been before,” he says of the waterway in northern Illinois that encompasses a series of lakes connected by the Fox River. He visited area boat manufacturers who worked with wood in hopes of learning. It didn’t take long before Horton realized they didn’t know what they were talking about. 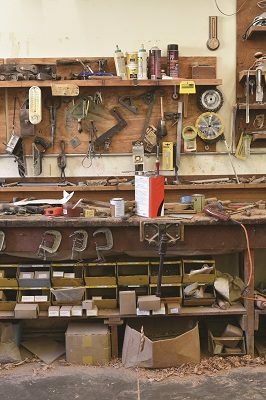 Along the way he picked up a book, Real Runabouts, — a worn copy still holds a place on his bookshelf — and learned of a company called Streblow Custom Boats, which was then located in Kenosha. Finally, he found the shop and hung around the place long enough to get hired — it was the start of a voyage that’s led him to where he is now. Wood is the foundation of the Streblow brand. The framing of a Streblow boat is white oak, the bottom is marine plywood and Philippine mahogany is used for outer planking. 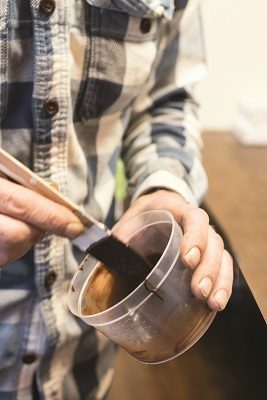 Mahogany was hard to find after World War II when Larry Streblow built his first boat, so he used mahogany from shipping crates. How do you pick out the wood? Office Manager Sean Slattery smiles. “The professor can do three hours on this,” he says, nodding to Horton. However he’s not afraid to reject a whole shipment of wood if it doesn’t measure up to Streblow’s high standards. Larry Streblow, the company’s patriarch, grew up on a farm. Finding ways to make ends meet, his father once fashioned violins out of wood, just as Larry would eventually do with boats. Larry was given a rowboat when he was just 11 but couldn’t leave well enough alone. It didn’t take long for him to turn it into a paddle boat by retrofitting it with a bicycle pedal and a water wheel. He studied engineering and helped design water pumps for boats during World War II. After the war, he pursued boat-making as a hobby. He bought the plans for his first boat, then realized he was smarter than the people who made those plans. So, he decided to build a boat from his own ingenuity. Along the way, Larry worked on several prototypes, including a racing boat with reverse hydroplane, steered by a front rudder. He built a prototype of an amphibious car — a project that never got afloat. His first boat was such a hit that friends and boaters at the Kenosha Yacht Club asked him to build boats for them. Soon that hobby turned into a business and in 1954 Streblow Custom Boats was incorporated. 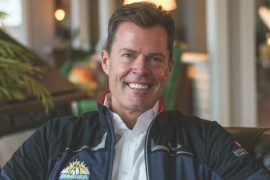 The company’s location in Kenosha was a plus, according to Horton, because Streblow had an opportunity to take the boats to Lake Michigan, “to see if he could break them,” Horton jokes. 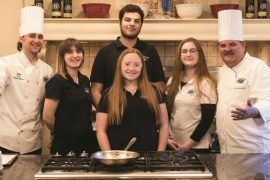 It took a few years, but soon Larry moved the company from his three-car garage in Kenosha to its current location, where wealthy enthusiasts provided a readymade clientele. Larry didn’t rest on his laurels. He tinkered with his original design and incorporated new developments in the boat-making craft. A new, modern Streblow premiered in 1968. According to company lore, the design came to Larry in a dream. 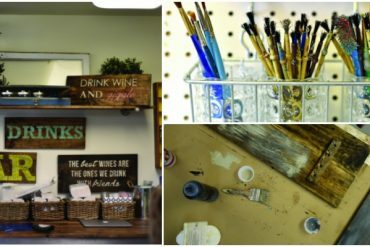 Larry worked on his hobby-turned-business until his dying day at the age of 82. 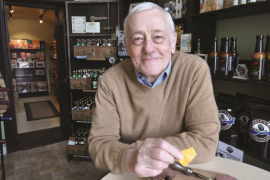 Passing on the business to a second generation was natural — and came easily. Randy Streblow, Larry’s son, had worked alongside his father since he was 12. Even before that he was cleaning out bilges and mastering the delicate craft of sanding. His boat building apprenticeship started in 1957, three years after his father incorporated the business, so he was part of it almost from the start. Randy had only a high school education, but he learned the skill of engineering from his father, who was a magician at turning practicalities into art. He also honed his skills during wartime, working on helicopters during the Vietnam War. 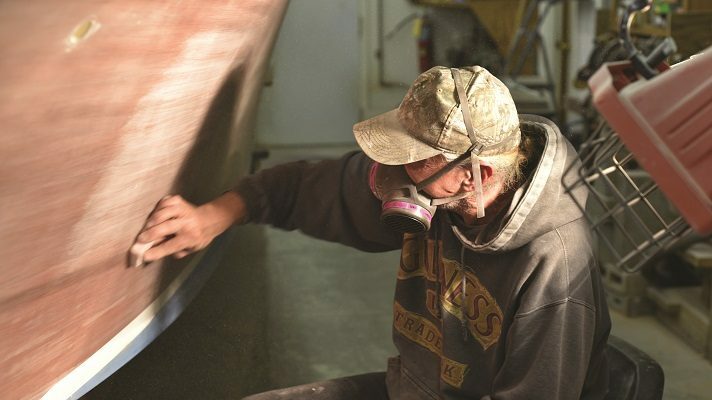 Randy learned the craft from reading trade publications, so when his father died he had already completed his apprenticeship and the transfer of the business from one generation to the next was seamless. Streblow’s family grew along with the business. Randy’s wife and two children became keepers of the Streblow brand as well. And, like his father, he never retired, working 10- to 12-hour days into his 60s. When Randy died in 2011, the next summer his contributions to the boating community were honored. 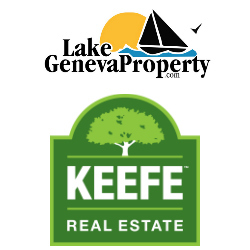 Some 50 Streblow boats and other brands gathered in Geneva Lake for what was called a “Wake on the Lake.” When their engines were gunned, some thought it sounded like a flyover of B-52 bombers. 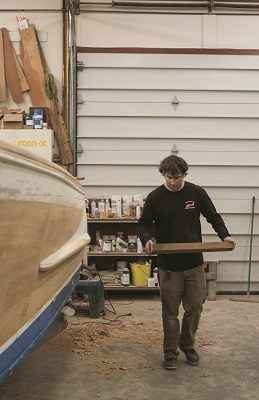 So many have asked what makes these boats so unique (there’s almost a cult-like following), and what does the process entail for building a one-of-a-kind boat? The answer? Horton and the customer work through the design together, so each boat is an original. Each Streblow is painstakingly put together. 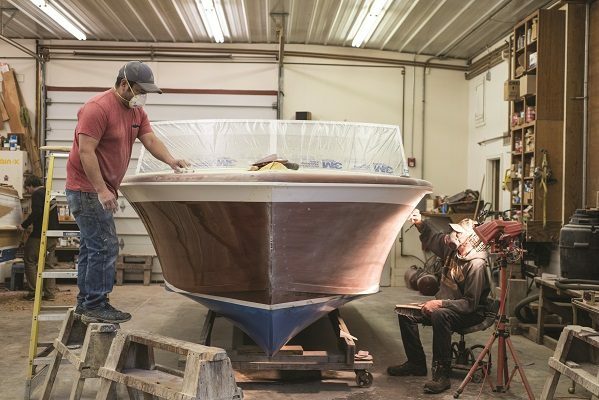 While the company houses and does maintenance on many Streblows, they build only one new boat a year — a task that takes two people an entire year to complete. Not surprisingly, a Streblow boat is not inexpensive. Some have sold for nearly a half-million dollars. A Streblow owner might say Amen to that.